Weta Workshop's The Hobbit Wraith Helm of Khamul the Easterling Statue is a 1:4 scale helmet made from polystone. It's a limited edition of just 750 pieces! Working with original designer Daniel Falconer, 3D artist Mauro Santini digitally captured the fearsome horned helm of Khamûl, second among the nine Ringwraiths, to produce this breathtaking collectible. Ages 14 and up. Second among the Nine was Khamûl, who had been a king among the peoples of the East. 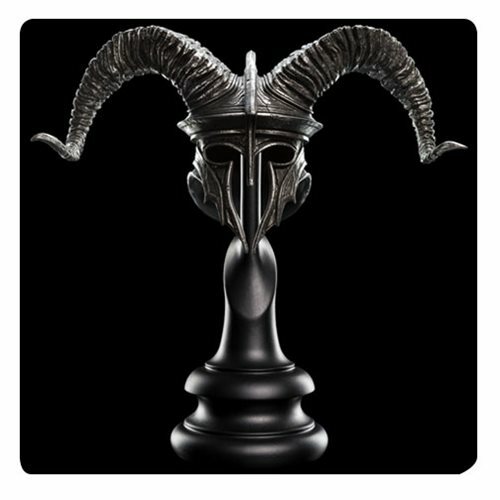 In war, he bore a great spiked mace and a helm made in the fashion of an Easterling warrior, though richly engraved and crowned with wide, curling horns.